In case you didn’t notice yet, Android 5.0 Lollipop introduced a battery saver mode, which eliminates the need of searching for third party apps that are supposed to help you preserve battery life. Of course, manufacturers like Samsung, LG and HTC have had a similar feature before Lollipop, but it’s great to see this available for each and every device that’s running (or will run) the latest version of Android. As you’d expect, enabling battery saver on Android Lollipop is not a complicated thing to do. First of all, you need to pull down your quick settings menu, and tap on the battery status indicator that’s found at the top. A battery settings sub-menu will open, from where you need to tap the three-dot menu button seen on the top right. Next, tap on “Battery saver”, and simply turn it on (it’s obviously off by default). From here, you can also set battery saver to turn on automatically, when your battery is either at 5%, or at 15%. Exactly what does battery saver do when activated? Well, it reduces performance, and limits vibration and background data (thus, apps that are usually synced in the background - email, Facebook, messaging, etc. - will likely not update unless you open them). Android Lollipop will let you know whenever battery saver is on by changing your device’s top and bottom bars’ color from black to orange (at least that's what happens on stock Lollipop). This may not look too good with all of your wallpapers, but that’s not really important when you’re looking to save battery life, right? How to enable battery saver mode on Android 5.0 Lollipop. Battery saver - here it is! Accessing the battery settings sub-menu is easy! Now battery saver is enabled, and you can choose to turn it on automatically. Notice the orange bars at the top and bottom, letting you know that battery saver is enabled. 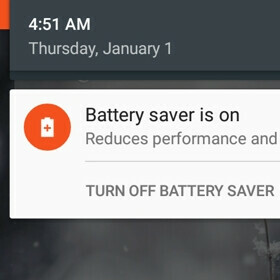 When battery saver is on, you get an option to quickly turn it off from the notifications area. Nah. It's simpler in Samsung devices. Slide down notification bar and tap "Power Saving Mode". Spiderpig is right. Unless you're a complete moron (read in between the lines, I'm saying you're a complete moron), this actually easier to do on Samsung devices. Double finger pull down to activate the toggles. Press the button. You have two options. Power saving & ultra power saving. Don't be a keyboard warrior. The point was that there's too many toggles and options that clutter the Samsung phones. It's stupid and ignorant to even deny it. Right. You would know because you had a Note 4. Keep perpetuating that lie too. You're the biggest joke on PA. I had a Note 4. Get over it. What's wrong about having a lot of options? Living in Apple's walked garden for so long has made him afraid of options. Variety is the spice of life, but it can be a scary, overwhelming thing for those who have never experienced it. Variety is what's killing Samsung but by you drinking their koolaid you wouldn't see it. It's the clutter not the options I have a problem with. How well does it actually work? Anyone tried it oit? How to push notification of whatsapp only on power saver or there is no way except open it to recive chat ? The orange bars are very irritating. Just to clarify, if you are using it right you normally won't see an orange stripe. The Battery Saver on/off switch turns it on manually regardless of the battery level. You probably don't want to turn this on except in odd circumstances. The Turn On Automatically drop down will activate it at the specified level. It will work with the Battery Saver switch off. In general, I'd recommend Battery Saver off and Turn On Automatically at 15%.